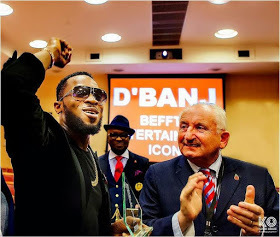 Multi-award winning singer D'Banj took to his Twitter handle this afternoon to announce that he just received the BEFFTA Entertainment Icon Award at the British House of Parliament from Lord John Bird. Congrats to him. Former President Jonathan took to his Facebook page to appeal to Americans to stop the Anti-Trump protests. Aggrieved Americans have been protesting the emergence of Donald Trump as the next US President.